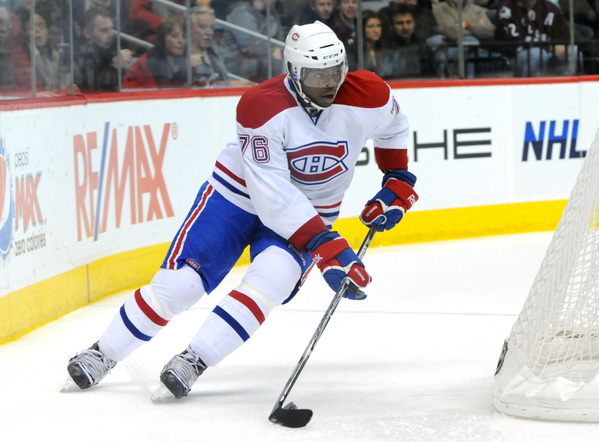 Early Friday morning, PK Subban clinched Game One for the Montreal Canadiens with a power play goal in double overtime. It really was a fantastic and exciting game, but of course that was all ruined shortly after Subban rifled one past Rask. After the game, numerous racist tweets, ones that I cannot repeat on here, were directed at PK Subban. It was an embarrassing display by Boston Bruins fans. Of course, this is nothing new with Boston fans. In 2012, numerous racist tweets were directed toward the Washington Capitals’ Joel Ward after he scored the series clinching goal in an upset victory over Boston. This display of racism by Bruins fans is upsetting and really doesn’t make much sense. People forget that PK’s younger brother, Malcolm, is a goaltender in the Boston Bruins system, one of the Bruins’ best players, Jarome Iginla, is black, and Willie O’Ree was the first black man to play in the NHL and he did it with the Boston Bruins. The Boston Bruins have a great history when it comes to blacks and minorities in hockey, but why don’t Bruin fans realize this? After Subban scored the game winner, a Bruins “fan” threw a water bottle at him on the ice. He was booed almost every time he touched the puck. Subban really has become Boston Public Enemy #1. It’s all fine and well to have a villain, I mean what would Superman be without Lex Luthor or Batman without The Joker. Teams need to have villains and that’s what makes rivalries so great. However, there is a line and some Bruins fans crossed it tonight with racist comments and throwing objects on the ice at the direction of Subban. Not all Boston fans speak for those that tweeted racist remarks towards Subban and Montreal fans have decried these comments. There was an outpouring of support towards Subban and not condoning the horrible comments. I don't want to hear about racist tweets re: PK Subban. Please don't give these morons the attention they crave. I don't care if you don't like PK Subban. I don't like him either. But making racist comments about him on twitter? Come on. The city of Boston already has a stigma of being a racist city attached to it and last night didn’t exactly disprove it. Not all Boston fans are racist, in fact I’d say just a small fraction are, but when they come out, they come out full force. After what happened this week with Los Angeles Clippers owner Donald Sterling and his racist comments, every racist sports view is that much more magnified and this display tonight makes Boston look pretty awful. I grew up and still live in New England, the heart of Bruins country, and Bruins fans really are good people. You are better than this. You are better than the terrible display at sportsmanship in Game 1. I truly believe this. For those of you spouting off racial diatribe towards Subban, please stop following the Boston Bruins and the game of hockey, there’s no place for you here. Boo and jeer PK Subban all you like, but please stop the racism and the foreign objects off the ice. You are Boston. You are better than this.